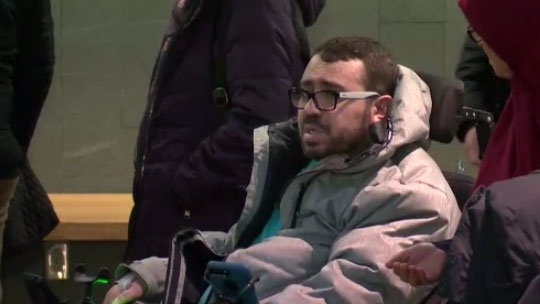 A visibly emotional Aymen Derbali sat in his wheelchair while addressing media after Alexandre Bissonnette's life sentence with a possibility of parole after 40 years was handed down on Friday. Derbali was gravely injured when Bissonnette opened fire in a Quebec City mosque on Jan. 29, 2017. He was shot seven times and left paralyzed from the waist down, suffering nightmares for over a year afterward. 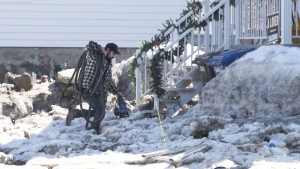 The sentence, which was reached months after Bissonnette pleaded guilty to six counts of first-degree murder and six counts of attempted murder, shocked Derbali and others who were affected by the shooting. Hassan Guillet, an imam who gained widespread recognition for his remarks at the funeral for three of the victims, said the victims' families were looking for a peace of mind and healing that the verdict did not deliver. “We are disappointed. In the judgment, after talking about all the atrocities Mr. Bissonnette did in the mosque… to the point that the policemen in the courthouse were distributing Kleenex to the people there to sweep up their tears," he said. "There are so many details we either didn’t know or tried to forget. Killing people on the floor, planting seven bullets in the body of Aymen, and after seven bullets he’s still alive." Guillet did praise Justice Francois Huot for recognizing the role played by hatred in the murders, referencing Premier Francois Legault's recent remarks that Islamophobia is not a problem in Quebec. The mosque's vice-president Mohamed Labidi said the ruling was especially difficult for the children of the victims. "(Paroled) or not, they will revive their suffering in 40 years," he said. "All the children 20 and less, surely will survive this period and they will revive the suffering of their parents." National Council of Canadian Muslims Executive Director Ihsaan Gardee said the families were displaying a "sense of anguish and frustration" while hearing the verdict. Shocked. Gutted. Speechless. These are the words we’re hearing from mosque shooting survivors. They don’t believe Bissonnette deserves a chance to get out of prison, not even after 40 yrs. One survivor said he feels they, as Muslims, are being treated like second-class citizens. Aymen Derbali, who was left paralyzed from the waist down in the Quebec City mosque shooting, said he was astonished by Alexandre Bissonnette's sentence of life in prison with a chance of parole after 40 years.